It is also, also, especially when this quote is shared in my mostly-white, mostly-privileged zone of the angry-left internet: my side has made a scapegoat of one teenage boy for every action done by anyone else wearing the same hat. The quote is accurate: we have in fact made similar excuses around dehumanizing kids in maga hats as the "y'all" make about kids in hoodies. Millions of adults have descended on one kid on a school trip, we've sought out the worst-looking frame of a video and made a kid who was minding his own business into our scapegoat, millions of people aimed our hate at him, have continued looking for evidence that maybe he is a racist after our initial attacks were found to be full of holes, have called for his expulsion and doxed him and his family. This week, this one week, I haven't seen this before and I have been watching, the internet-mob on the left went truly overboard. Millions of us have directed hatred at a teen who whose worst clear crime was wearing a maga hat, we've doxed him, we've dissected some videos, we've made him a mirror for our vast and well-earned anger at the Trump movement, a scapegoat for more powerful men that we can't touch, a scapegoat for other kids from his school. 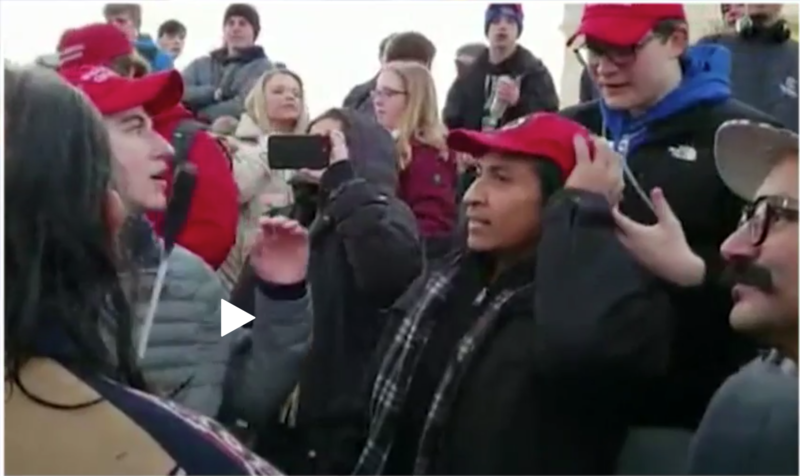 He is no longer Nick, he's "#CovingtonKids," all of their sins on him. Once we realized the facts didn't line up like the first accusation, we didn't apologize and back off, we kept digging, hoping we could prove that our initial accusation and gut instinct could be proven. And we are not apologizing, we are holding strong, digging in. Morally: this is bullying. We haven't defeated the powerful racists, so millions of us went after a kid, literally whose face we didn't like. Politically: this is, so obvious I feel funny saying it, guaranteed to fail, to solidify votes Trump's movement. The angry partisan internet this week has undone a year's effort by people trying to get decent, busy people to open their eyes and stop falling for the right's blame-and-shame politics. The quote is right, the people who've been watching black kids get gunned down and not care, who are up in arms today, they are not in the right. But today is our turn, at least I'm making it my turn, to model a politics of dignity without bullying. If we want to be effective, every one of us that overshot the truth and made accusations without clarity and without proportion, who made a scapegoat out of one kid for a whole movement — all of us who've faced bullying by powerful men and in turn bullied a kid — it's time to stop and apologize. No #whataboutism: Apologizing is not the apocalypse, either. I would like to see the quote as the opener for this: Adults should not see kids in hoodies or in maga hats as thugs or racists, to be shot or to be pilloried, doxxed and made the scapegoat of the week. Yes, we screwed up and made a scapegoat of a kid. Groups I support screwed up this time. I'm sorry. This blog is about communications and elections: one thing for absolute sure, there is no keeping "score" about right -vs- wrong in a way that apologizing weakens your team or weakens your cause. All the moderates, the quiet people appalled by today's politics: whoever starts to show some decency is going to win the next election. What would the world look like, the election look like, if progressives got ahead on this: if the internet were full of thousands of apologies for over-reaction, immediately followed calls to action stand against racism in the halls of power? What would your friends who hate politics think of that? This is intended as one of two posts about displaced anger: when to let it go (this article), when to focus and make it clear (upcoming). What would it look like to actually model the best behavior, to model what this country needs moving forward?